there lived the real-life Vanderbilt family of "The Last Castle." This narrative nonfiction book takes the reader on a Gilded Age journey from the height of excess to the depths of family tragedy in the glittering true story behind the largest home—ever—in America and the amazing struggles of those who resided within its walls. Constructed in the fading days of the Gilded Age, Biltmore House is a colossally huge, 175,000-square-foot chateau located not in New York, Newport, Bar Harbor or Los Angeles, but rather tucked away in the Blue Ridge Mountains of North Carolina. Its architect was Gilded Age legend Richard Morris Hunt, the man behind its enchanting grounds was the father of landscape architecture, Frederick Law Olmsted, and the woods surrounding the palatial home—roughly 125,000 acres worth of land—were the site of America's first attempt at managed forestry. But it was also home to remarkable individuals whose lives were forever changed by their time in Appalachia, and whose tenure there left an impact on a community that is still felt today. It is an intimate look at George, Edith and Cornelia Vanderbilt: a man with a dream, the woman who saved it, and the child who completed their fairytale tableau. 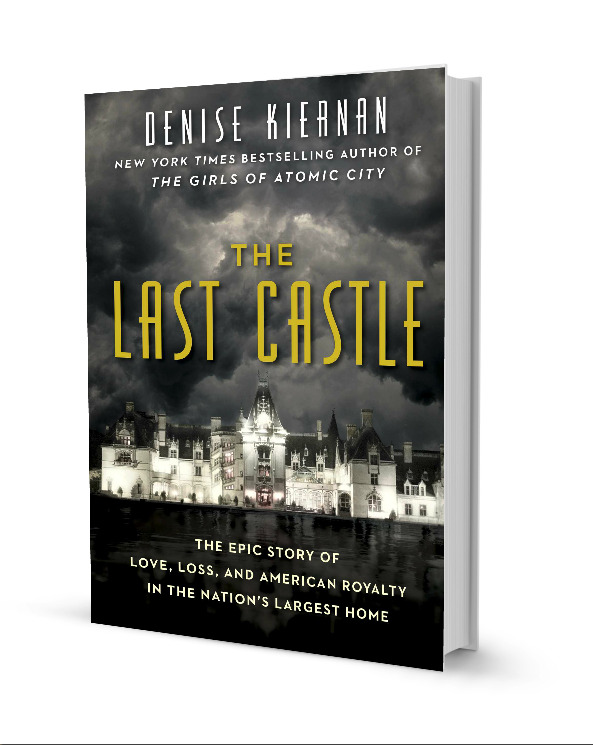 With guest appearances by Edith Wharton, Thomas Wolfe, F. Scott Fitzgerald, Henry James, Teddy Roosevelt and more, The Last Castle spans world wars, financial crises, and unspeakable tragedy. The Last Castle is a saga of brute achievement, inspiring generosity and unlikely endurance. Published September 26, 2017, by Touchstone/Simon & Schuster, The Last Castle is available now wherever books are sold. Signed copies are available from the indie bookstore Malaprop's as well as other participating booksellers across the country. Published by Touchstone/Simon & Schuster. And of course, autographed and personalized copies are ALWAYS available through Denise's local indie, Malaprop's. I continue to travel to discuss all my titles, sign books and also to share insights into writing and publishing. I will be on tour in the Fall 2017 to promote The Last Castle. and if you are interested in having me come to your town, please have your local bookstore representative contact Jessica Roth at Touchstone/Simon & Schuster. Apart from my book tour, I have speaking engagements and book signings coming up across the country at colleges, city forums, corporate meetings and more. Please stop by my "Speaking Engagements" page to learn more about my schedule and find out about how to book me for your own event. Are you coming to my city on tour? I hope so, but I honestly do not know. My book tour is set up by my publisher. If you would like for me to come, please let your local bookstore know and they can contact Jessica Roth at Touchstone/Simon & Schuster. I'd like to give an autographed copy as a gift. How do I get one? There are a couple of options. The bookstores listed above are now taking preorders for signed first editions. My local bookstore, Malaprop's, is offering the same. (You can learn more here.) You may also ring Malaprop's at 1-800-441-9829 or 828-254-6734 and request a personalized copy. You can give them your name, to whom you want the book inscribed, and they will even gift wrap it for a special occasion. It will ship out to you upon publication, ready to go. Do you do book club visits? Yes, usually via Skype, but only a limited number of them—two per month. If you are interested in arranging a book club visit, please contact my publicists at Gold Leaf Literary and they will get you on the list. I'm a book blogger. Can I arrange an interview with you? Absolutely! Shoot a note to my publicists at Gold Leaf Literary and they'll get you on the schedule.